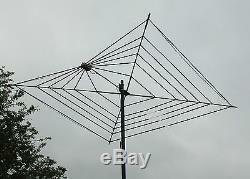 NEW COMPLETE TWIN WIRE 7 BAND HF COBWEB BASE ANTENNA. BUILT FOR 4-6-10-12-15-17-20 METER COBWEB. BY RADIO HAMS FOR RADIO HAMS. NOW AVAILABLE IN 5 OR 7 BAND VERSIONS. Please wear gloves when working with fiberglass. Total weight 6.5 kg. This is not a kit its a complete antenna that covers 14-18-21-24-28-50 MEG and proving to work very well on 70 meg 4 meters. WITH HEAVY DUTY CABLE MOUNTING P-CLIPS. OVER ALL SIZE 8'6" SQUARE (2.59 METERS) MOUNTS TO A 1 1/2 to 2" POLE WIND SPEED WILL TAKE 120 MPH PLUS This cobweb was custom built by me following the cobwebb reveled instructions The modifications I made were the supports there are now fewer parts and less joints. I USE 16MM SOLID ROD NOT 12MM AS THE ORIGINAL HAD. I use pulltruded fiberglass rods an tubes for extra strength. All the other parts are as the instructions. PLEASE WEAR GLOVES WHEN BUILDING ANTENNA. But I used twin 42 strand figure 8 cable unlike the 16 strand that was used so the antenna will now take more power. I use the same junction box that is sealed inside and outside an has a built in balun choke. I use very tough alloy plate for the cross support and mast mount all u-bolts are galvanized so they. Will not rot away and are fitted with nylock nuts so they will not come loose and fits to a 2 inch mast. S0239 SOCKET FITTED SO A STANDARD PL259. So all you need is to feed it with a run of any 50 ohm coax of any length. 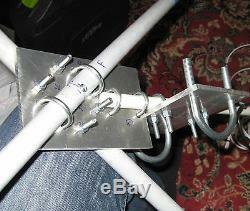 24 Top quality cable ties will be sent to secure the element to the rods as in the pictures. This antenna has been set on a 6 foot alloy pole a little. Tuning will be required for full band coverage an atu maybe needed on some bands. You may need a few small cable ties for fine tuning the elements. But full instructions on how to tune the antenna along with the construction instruction. Will be posted and taped to the antenna when it arrives. PLEASE NOTE AN ATU MAY BE REQUIRED FOR SOME BANDS The overall size is 8 foot 6 inch square. All the elements double gama t matches are sealed with high quality heat shrink to keep the weather out. The cobweb is fully Omnidirectional so no need for expensive rotators. A dipole or a CobWeb has a gain of about 5dB over a dipole in free space. (due to ground reflection) or 7dB over an isotropic radiator (7dBi) and will work equally well over the entire band. The CobWeb has no lossy components in it, so there are no power limit problems for the. QRO operators 600 WATTS PLUS. The low loss and consequent high radiation efficiency 95% also makes it ideal for QRP! Pure horizontal polarization so very little chance of EMC or static problems. You will get 6 half wave dipoles one each side with no nulls or flat spots in a space of. Less than 9 feet square. You even get 2 heavy duty pole clamp u-bolts to fix to your 2 inch scaffolding tube with nylock nuts. WITH SINGLE PIECE BOOMS AT 1.44 METERS. 2 REINFORCED TUBES IN THE CENTER HUB. 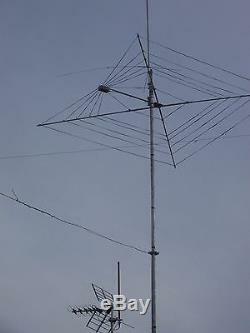 This was done as a radio club project so some of the best brains in ham radio went into building this. 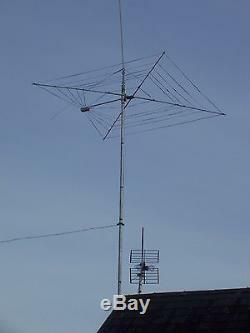 An ATU may be needed due to the spread of the bands covered by this antenna as with any dipole. The antenna has been test with the full UK limit but will happily take far more so the UK limit is no problem. ITEM WILL BE SENT TRACKED TO MAKE SURE YOU GET IT. 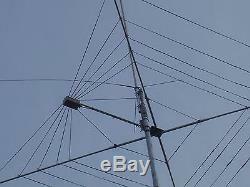 The item "COMPLETE 7 BAND HF COBWEB TWIN WIRE ANTENNA CUSTOM BUILT 4-6-10-12-15-17-20" is in sale since Thursday, May 28, 2015. This item is in the category "Mobile Phones & Communication\Radio Communication Equipment\Antennas\Ham/Amateur Radio Antennas". The seller is "mcr666" and is located in WF9 PONTEFRACT. This item can be shipped to all countries in Europe, United States, Canada.